Catnip contains nepetalactone, which is a stimulant for cats. Catnip is safe for your cat; it does not contain any harmful substances. 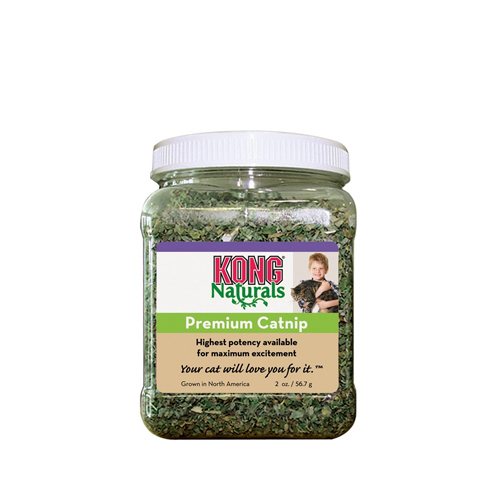 KONG Naturals Premium Catnip is premium catnip from North America. It is not harvested until the flavour, colour and scent are at their best, after which it is field dried. Twigs and seeds are reduced to a minimum, so that the product contains more of the essentials oils that trigger a response in most cats. KONG Catnip can be used as a treat or in the refillable KONG catnip toys. Have you used KONG Cat - Naturals Premium Catnip before? Let us know what you think about this product. Good price, arrived quickly and safely,cats very chilled.